I patted my camel’s neck as he turned towards the pyramids. They stood, three majestic pieces of history, glistening out over the horizon. The sand blew into my eyes as my father barked at me to spin the camel around for a picture. “Does the camel have a name?” I asked his owner, as I nudged for the camel to turn. “Yes. He’s named KFC — Kentucky Fried Camel.” He laughed at his own joke. Egyptians had a deep, inexplicable love for KFC. Not a single person I had met had been able to explain why. My father came up on the other side of KFC. He gazed out over the pyramids. It took me 27 years to finally visit my father’s, and by extension, my homeland. My father had immigrated from Egypt in his 20’s to England, where he lived for 12 years before immigrating to America. He promised that he would take me back to his homeland but it took years for him to fulfill this promise. There had been many reasons why it had taken me so long to get to Egypt: I never had enough money to go, my dad had never had enough money to take me, my mom had never trusted my dad to take me, etc . . . I wasn’t raised to be Egyptian. My father never taught me Arabic, I didn’t learn proper Egyptian customs, and my knowledge of Islam is subpar at best. Nonetheless, I wanted to see Egypt, and during one spring break, I finally went with my father. My initial reaction to Egypt was that I was going to die. Having grown up in the suburbs of Los Angeles, I was used to wild drivers, but Cairo drivers considered traffic lanes to be suggestions. My cousin Ahmed nearly got into a wreck as we exited the airport. He didn’t actually look like me, and I couldn’t remember which cousin he was related to (my father had attempted to prep me on all eight million of our cousins and I remembered two). “It’s nice to meet you, Yasmina,” Ahmed told me, as he proceeded to cut three people off. “You too,” I gripped his backdoor handle, praying for dear life. While the two jabbered away in Arabic, I took in the surroundings of Cairo. A number of men wandered out into the street, completely oblivious to the cars honking and the drivers swearing at them. Girls wearing designer hijabs lounged on street corners, casually sipping on cups of coffee. I didn’t understand any of the street signs but could see stores lining the streets with makeup, dresses, soccer jerseys and hats. The honking never stopped. I couldn’t tell if they were honking at other cars, pretty girls or the person in the car next to them. It didn’t seem to matter, they just kept honking. “Jiofnaoiewjoiwfnioewanfoiafnoew?” My father cut in, to which Ahmed laughed. We arrived at our hotel, a chic, emerald structure in the heart of Heliopolis, the city where the rest of my cousins lived. As we pulled into the driveway, a bulky soldier with a machine gun stopped our car. A large German Shepard followed at his heels. He knocked on the back of Ahmed’s trunk, which he popped open. “Since the Revolution, our security is much tighter,” Ahmed explained as the man closed his trunk and motioned for him to come into the hotel. “Is it bothersome?” I asked. We got out the car as a man in a pristine black suit sauntered towards us. He motioned for my bag, which he threw through a metal detector. “You don’t speak Arabic?” He asked me in English, raising his eyebrows. “No, sorry.” I hung my head in shame. “Jionweoijafhhoeowanojfioa,” My father came around my side and put his bag through the metal detector. “He never taught me!” I protested. It was true. My father had brought me an Arabic workbook and after about a month of attempting to teach me decided that it would be easier for me to learn more about soccer since that was always on the TV. My father had never been a good teacher, and every time he tried to tutor my sister and me in math, he threw his hands up after about 10 minutes and went to go eat. “It is,” I responded, as three horns went off. “Welcome to your homeland! This is your country too. I hope you will find everything to be enjoyable.” He beamed as he opened the front door for me. “How do you say thank you?” I whispered to my father. “Shakran,” I said to Mohammed. The next day, my father and I boarded a plane to take a cruise along the Nile to visit Luxor and see the ancient sites along the way. Upon arriving in Luxor, we were surrounded by dozens of Chinese tourists donning large, straw hats and speaking with themselves in Mandarin. An Indian family dressed in full saris struggled with their suitcases, and a man wearing a full galabeya sauntered by, shouting at someone on his phone. This sight caused my father to fall into a fit of giggles. “Check out Lawrence of Arabia over there,” He giggled, pushing through a gaggle of Chinese tourists. “It’s not nice to make fun,” I hid a small smile. He did look rather odd. We began the journey in Aswan, arriving there after a few days. The Nile in Aswan was a sparkling, shimmering blue that was so bright I forgot it was a river and not the ocean. 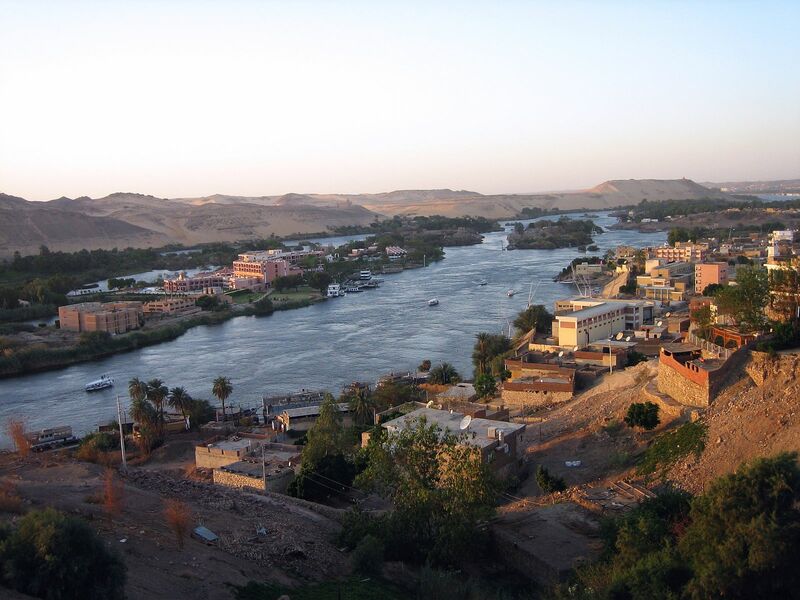 My father and I settled into our room and he quickly decided to give me a brief tour of Aswan. He strode down to the lobby and marched right up to one of the desk attendants. This continued on for a while as the Chinese tourists oohed and ahhed over luxurious pieces of silk. They poked at the gold camel statues and the hieroglyphic necklaces as a bored salesgirl clicked away on her phone. “Do you like your homeland?” It took me a minute to realize that the attendant was speaking to me. I prayed that he did not bore our poor attendant. You could always tell if my father liked someone because he would bring up one of the following topics: The Ottoman Empire, Soccer or 401Ks. “Okay, Mina let’s go.” Thankfully it was a short lesson. Baba pulled me through the deck and onto the street, where cars whizzed by. Vans held a good 10-15 people, two of which were nearly dangling out of the side. Men shot by on mopeds past full horses and carriages. Women lounged on park benches as boys kicked around a soccer ball. And just like in Cairo, there was constant honking. I struggled into the carriage while my father clambered in next to me, barking at the carriage driver. Dust blew into my eyes as we passed men sitting outside, smoking hookah and shouting at one another; teenage girls strolling arm in arm, stopping every few feet to take a selfie; dogs sauntering down the street and cats tucked by trash cans; soft city lights glowing in the distance. I gaped as an entire family of five roared by on a moped. 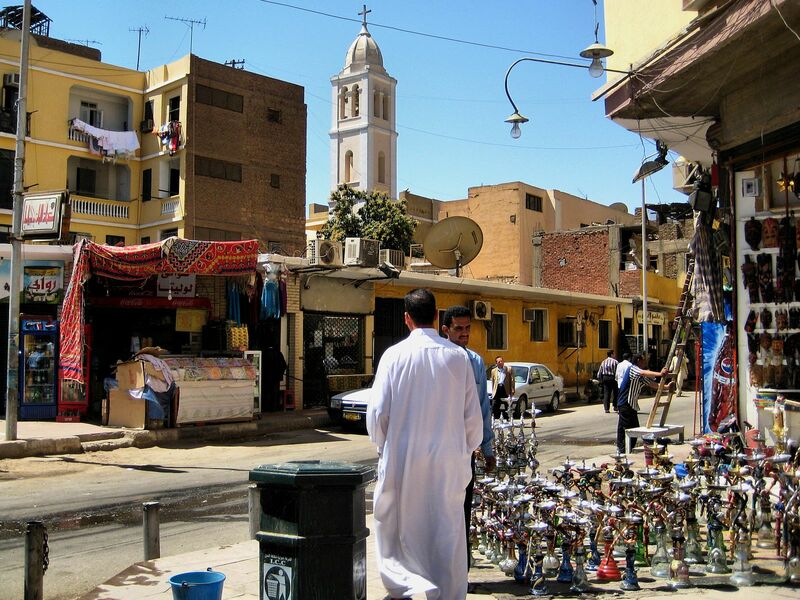 Cairo had felt more modern, whereas Ashwan felt as though it had stopped growing sometime in the 1950s. Along the way, I noticed there were stores framed with pictures of smiling couples and pink and white dresses. “Those look like Quinceanera dresses,” I commented to Baba, who nodded. We passed a bronzed statue of a man with a pen in hand, staring down at a piece of paper. I sat back in the carriage, reminded of how I had also fled — in my case, Orange County for New Mexico — in order to get a decent education as a writer, and because, I too, was bored. I had needed a break from Orange County and I wanted to see what the rest of the country was like. So without knowing anything about Santa Fe, I decided to just hop on a plane and give it a go. Unbeknownst to me, one of our cousins had hired a tour guide/archaeologist to show us around the various temples. His name was Ahmed, and it became quite clear why our cousin had hired him: my father knew nothing about ancient Egypt or Egyptian mythology. 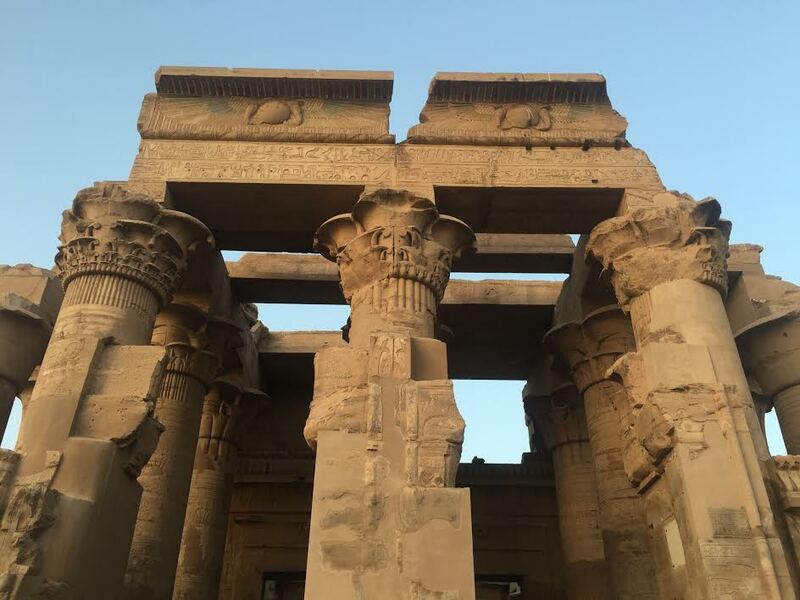 “Today we are going to the Temple of Philae,” Ahmed told us, as we embarked on a small boat across the Nile. The boat looked as though it had been plucked straight from Disneyland’s Jungle Cruise. But instead of having a cheery skipper who cracked jokes, we had a sullen boat driver, who responded in short grunts when spoken to. The second we got off the boat, peddlers surrounded us. They were like locusts, creeping into every crevice, their voices shrill and sharp. We shrugged them off, my father grinning as he did. He made the mistake of slipping into Arabic, and it was over. Every peddler was on him, insisting that he buy something, that as an Egyptian, it was his duty to buy something. He laughed, the rush of the haggle brightening his face, as Ahmed led us to the temple. Ahmed walked us through the different temples, the deep carvings of Gods and Goddesses bearing down on us, the long columns with different tops, the sand blowing in the wind and the heat burning through my hat. He explained that in all Egyptian mythology, it always focused on the family: the father, the mother and the child. This was why in Egyptian culture, the family was so important: it literally went back to ancient times. While I found the legends to be easy to understand, my father did not. No matter how many times Ahmed explained who Osiris or Isis was, my father would ask again, much to his chagrin. At one point he let out a sigh, wondering how the people of Egypt do not know their own history, yet others find it so fascinating. Upon leaving the Temple of Philae, we went to a different temple, the Temple of Sobek and Haroeris, which was dedicated to Sobek, the crocodile God. Ahmed informed us that when the temple was used, live crocodiles were also housed, alongside the humans. When I asked Ahmed why he liked Sobek so much, he simply answered, “He’s a crocodile God,” which admittedly, is a good enough reason to favor a God. Over the next few days, we sailed from town to town, exploring ancient temples with scrawling on the walls. We drank tea every day at 4 p.m., and Ahmed tried to give us lessons on hieroglyphics and mythology. By the third day of my father forgetting everything he had said the day before, Ahmed became more interested in watching the Chinese tourists. They played a game in which they kept clapping their hands and cheering, all for no apparent reason. “Why does this keep happening?” Ahmed burst out laughing at the sight, which had now evolved to include slapping and screaming the table. We passed through Edfu, a small Egyptian village to see yet another temple. Skeletal dogs roamed the streets as a young girl, who could barely speak or see, tried to sell me tissues for a mere Egyptian pound. The buildings were decaying and every carriage was decorated with bells, whistles and in the case of ours, Tweety Bird stickers. We eventually made it to the most magnificent and well known of all the temples, Luxor. 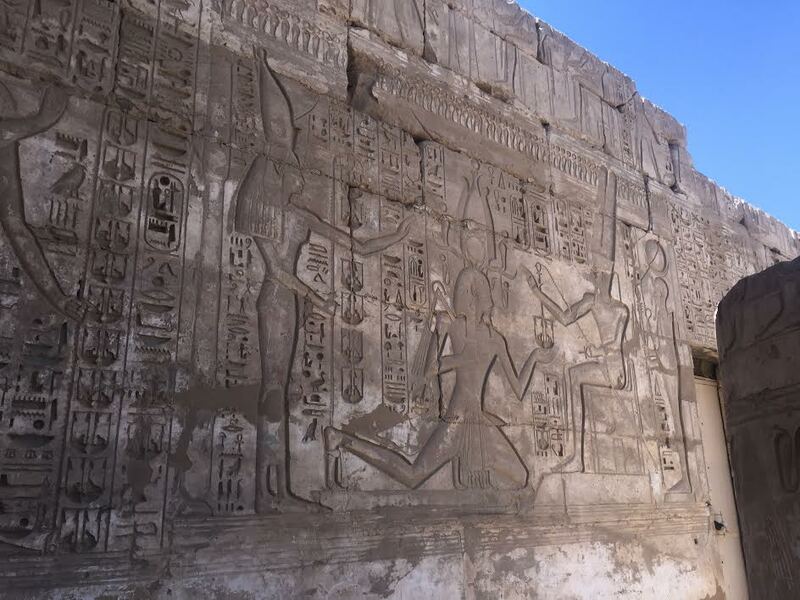 The largest city on our tour, Luxor was home to Karnak and Luxor Temple. As we first approached Luxor Temple, I was awestruck by the towering columns, the detailed sketches, the sprawling courtyard . . . and the McDonald’s directly across the street. “Huh,” I muttered to myself, as a wreck nearly happened in front of the McDonald’s. “Oh, this temple may not give us free admission,” Baba yawned, stretching his arms above his head. “I think I’m going to be British from now on,” Baba decided. True to his word, Baba decided we were British. He altered his accent to sound even more British than usual and even made friends with a family from Manchester. I nodded, afraid that my lack of a proper posh accent would give me away. Baba kept up his British facade not only at Luxor Temple, but also at the Valley of the Kings. It became clear just how many Chinese tourists came to Egypt, as the guards at the various temples had learned to bow and cry ni hao! much to the tourists’ joy. I also learned that if one wants a picture in the tombs, they can easily bribe the guard with a crisp 10-pound note. One just has to make sure no one else is in the tomb. Over the next few days, Ahmed regaled us with tales of the two most famous temples. Luxor Temple had a mosque in it, which actually did hold prayers. Karnack had nearly been bombed, but all of the shopkeepers and peddlers had managed to secure the attackers, all thanks to the bravery of a cab driver (and Allah). The ink on the temple walls, which were over 4,000 years old, were still vibrant, with various shades of scarlet and blue shimmering against the granite. As fascinating as the temples were, the tourists who visited them were even more so. When a British man dressed entirely in khaki posed in front of Ramses II for a picture, a group of Chinese women bombarded him, insisting on a selfie. He smiled bemusedly as they pointed at his hat. Ahmed and I concluded that they may have thought he was Indiana Jones. Numerous school children ran amok, their chaperones screaming at them to stay together and listen to the history of the temples. Just as American children often go on a pilgrimage to Washington, D.C., Egyptian children tend to go visit the ancient sites of Luxor and Aswan. And just like many American children, Egyptian children have no interest in the history whatsoever — they want to get as many selfies as possible for their Facebook account. Strangely enough, I was included in a few of these selfies, as random girls ran towards me, stuck a phone in my face and ran away. Anyone who wasn’t Egyptian was far more fascinating than the barbaric behavior of Ramses III. On our third day in Luxor, I obtained a suitor. We parked outside an aged white building, where a bald man dressed in a gabeya strolled over to meet us. He beamed as my father and I came out of the van, squinting into the bright sun. He had pristine teeth and dark sunglasses. Mohammed walked us through the entire process, and he explained that his whole family owned and worked at this shop. Baba walked ahead of me, taking in all of the different shapes and sizes of alabaster. There were sparkling green vases, charcoal cats, pyramids and stunning vases of colors I had never seen before. Ahmed headed straight for the back where another man emerged and set up a hookah for him. He proceeded to look at Facebook. “I’m amazed you don’t,” Ahmed replied, as the other man plopped down and began to jabber away in Arabic. “Your alabaster is very beautiful,” I told Mohammed, who had magically reappeared with a glass of hibiscus tea for me. “Do you like southern Egypt?” He shot me a pair of puppy-dog eyes. “Do you have Facebook?” He wiped out his phone and switched to his Facebook app. “Uh, yes . . .” I glanced over at Baba, who was rambling to a resigned Ahmed.. In the span of five minutes, I had caught myself an Egyptian suitor. To this day, I still randomly get messages from Mohammed, which are usually pictures of roses. He insisted I return to Luxor alone, so that he may show me the sights and sounds. If I ever grow tired of life in Los Angeles, I always have the option to go and live in the alabaster store with Mohammed. Upon returning to Cairo, my father introduced me to roughly 8,000 cousins. The majority spoke English, with the exception of a few who only knew how to communicate via feeding me falafels and selfies. I also met Uncle Wale, my father’s brother, who has written five books on Islam, and as all siblings do to one another, horribly embarrasses my father. Uncle Wale took us out to dinner at a fancy restaurant on the Nile. The long, flowing river was not as bright or as clear as it was in the South; it actually resembled the same mud and dirt as The Mississippi. Nonetheless, the Nile was one of the quietest places in all of Cairo, an oasis away from the constant honking. The cafes along the Nile soon became one of my favorite places in the city. “Joinownfoiana? !” Uncle Wale barked at the host, who either didn’t have a table for us or didn’t have the right table. “Buihbwbaifbbaibfa!” Uncle Wale stormed off, leaving us with the now disgruntled and confused host. “What happened?” I asked Baba, who had buried his face in his hands. Sure enough, Uncle Wale strode back up the host, who with a shrug, led us to our table, only to find a cat sitting in one of the chairs. When Uncle Wale tried to shoo the cat away, it stared at him, flicked its tail, and proceeded to roll over onto its back. This wasn’t the last time Uncle Wale would storm off. During one family gathering, where my relatives had prepared the equivalent of eight Thanksgivings, Uncle Wale became disgruntled and marched right out the door. No one reacted to this and kept eating. Two minutes later, Uncle Wale sauntered back in, urging everyone to finish eating so that they could go watch the football match. While none of my relatives matched Uncle Wale’s dramatic antics, they all had their own quirks. My cousin Tarek told me, in complete sincerity, that when we dream, our souls leave our bodies and we all meet up with each other in dreamland. He believed that this was why we dreamt of other people, we encountered them in dreamland. My cousin Kareem and I immediately bonded not because we were family, but because we both liked to watch RuPaul’s Drag Race. It seemed that, like my father, none of my family members were normal by any society’s standards. Every day felt like Thanksgiving, as my family fed me plate after plate of falafels, rice, grape leaves, chicken, pita, salad and glass after glass of crisp, refreshing hibiscus tea. I was adorned with gifts: gold vases scrawled with Arabic writing, purses featuring Egyptian film stars, lavender, sea green, silver hijabs and a stunning sapphire necklace. I gaped at the necklace as my cousin draped it around my neck, uneasy to accept such a gift but flattered at the same time. I was touched by their kindness. Despite never having met me, they opened their doors to me, fed me and treated me as a true member of the family. Despite my lack of Arabic and clear appearance as an American, they still accepted me. They truly made me feel that Egypt was also my homeland. Sarah Mina Osman is a writer and teacher living in Los Angeles. She is half Egyptian/half Cajun, which, yes, is a strange combination. She has traveled to four different continents and lived in Australia. When she’s not writing or teaching, she enjoys dancing, watching random shows she finds on Netflix and eating. She also has a deep appreciation for sloths and platypi.